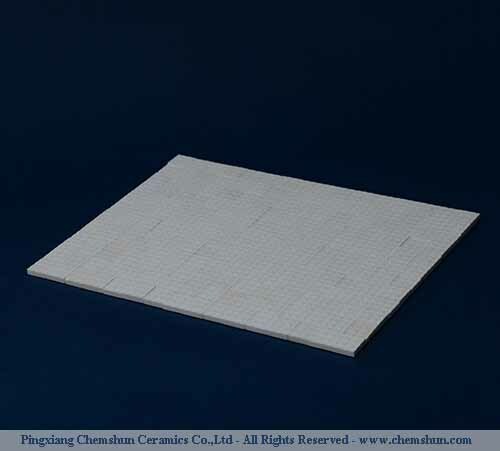 Chemshun® Alumina ceramic mosaic sheet is ideal wear resistant materials for bulk materials handling equipment. 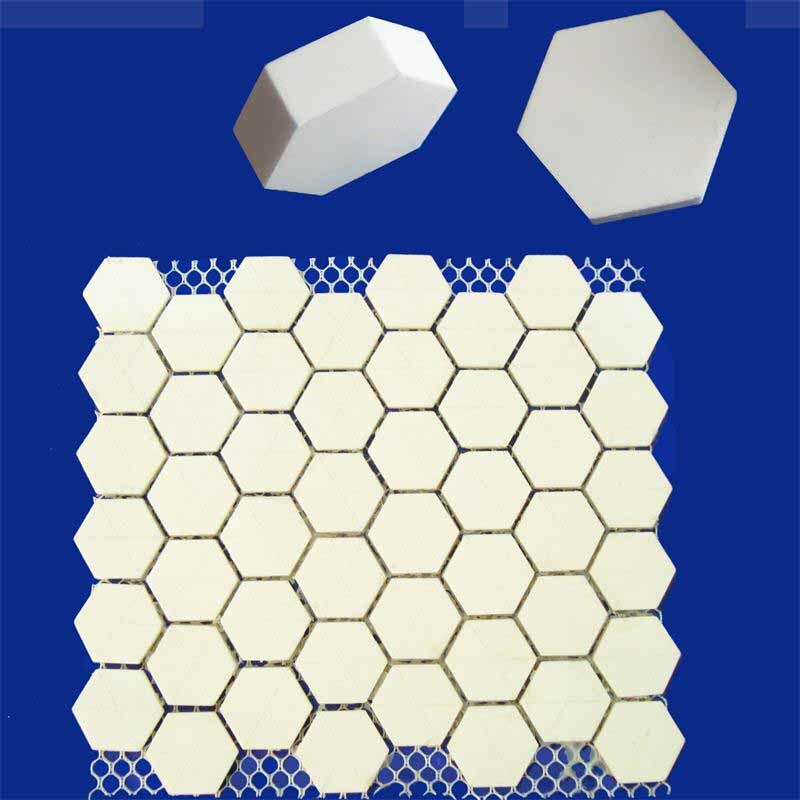 pingxiang chemshun ceramics co.,ltd as China alumina ceramics manufacturer/factory/wholesaler/distributor of alumina ceramic Hexagonal Mat, square mosaic ceramic sheet. 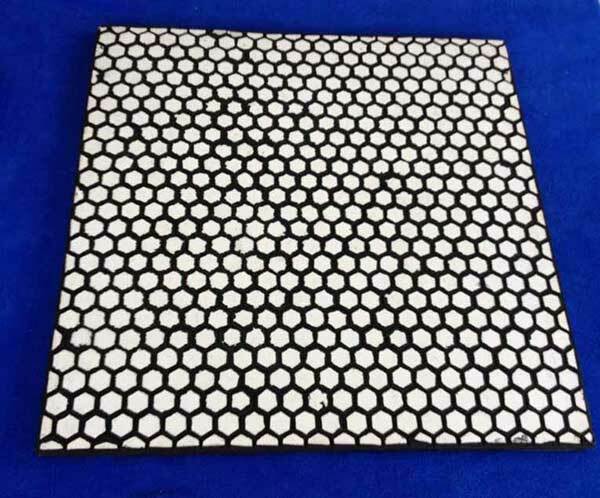 The alumina mosaic sheet is an excellent wear resistance ceramic product.Hexagonal alumina tile sheet used as ceramic pulley lagging, rubber ceramic plate, ceramic hose, fixing by expoxy resin glue. ceramic Mat150x150,300×300,500x500mm. Chemshun alumina ceramic sticked (sticked in net , silk , paper ) are used as lining with advantage of wear-resisting, impact resisting, easy operation, etc., is ideal surface wear-resisting material of material transfer equipment in iron & steel works, thermal & power plants, mine, etc. Normal sheet/Mat/Back size 150×150, 300×300, 500x500mm. 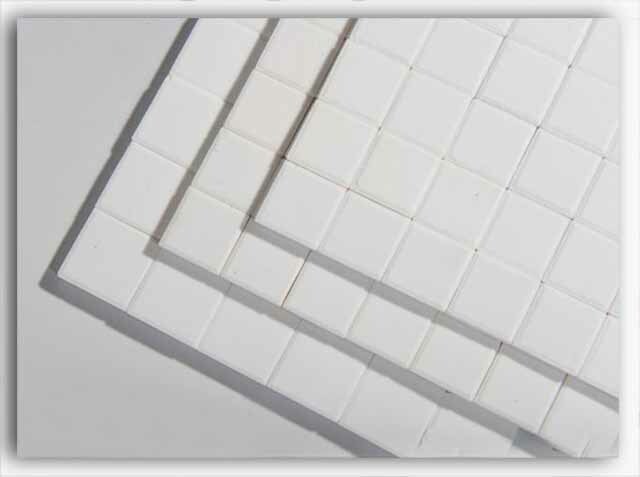 square ceramic pieces 10x10x2mm, 10x10x3mm, 10x10x4mm, 10x10x8mm, 17.5×17.5×3~10mm. 20x20x4mm, 20x20x5mm, 20x20x6mm, 20x20x8mm, 20x20x10mm. The back material: Nylon net, paper, silk. The wear resistance alumina ceramic products are made from the high purity, super fine and single narrow particle high-quality grain alumina powder, which is spray-dried processing, formed by cold isostatic pressing, firing on 1520 º C~1650 º C temperature. Subject to Al2O3 content difference, we have 92%, 95%,abrasion resistance ceramics. The package: by paper carton, then fasten on pallet. -Used to construct ceramic rubber plate as wear-and-impact-resistant lining. -Used as wear resistance ceramic materials on the industries of chemical, mining, metallurgical, cement etc. Directly fixing on the equipment, easy control and application. -Used as component of ceramic bearing. -Used as ceramic hose major material. Chemshun mosaic sheet is ideal wear resistant materials for bulk materials handling equipment.